Xaldin was a lone wolf in every sense of the word. He didn’t care about anyone and was more obsessed with watching Beauty and the Beast than anything else. Even though he’s higher up in the Organization, he doesn’t seem very important. Xaldin represents the true definition of what it means to be a Nobody: he’s thoughtless, inconsiderate, and he shamelessly denounces having or wanting feelings or emotions, and is almost disgusted by those who express them. He wants a heart for the simple fact of being able to do what people with hearts can do–not really for emotions. By far one of the toughest Organization members to face in the game is Xaldin. Other than strength alone, Xaldin is sadfully a wasted Organization member. His primary focus being to turn Beast into a heartless, for a year Xaldin only manage to focus on this one thing and he fails even at that (and Roxas and Sora visit Beast’s castle but so many times for us to pay him much mind). Xaldin himself is an independent member of the Organization. He is seen by himself most of the time and seems annoyed when paired with others, which hurts his importance within the series despite being Number 3 in rank–I doubt he was around any of the important characters enough to warrant much back story. His own personal “feelings,” thoughts, and independent nature detaches him from the Organization as a whole, which is a shame because he is one of the best Organization 13 members overall. Him being such a powerful boss fight, he should have been a powerful influence as well. Mickey Mouse had to jump in to save my life from Xaldin! Being an original member, his role should have been greater, but we barely know anything about him other than he was an apprentice. My only guess is that he himself knows how to hurt a heart because his own heart was deeply hurt and wishes not to feel hurt emotions again, but it’s hard to imagine this huge man heartbroken. I doubt we will see his Somebody again, unless another spin off includes him. Vexen was one of the more important characters in the Organization--but he wasn’t exactly popular. He may reappear in future games, but his screen time would likely be limited. The brains behind the Organization, Vexen sits high in rank as number 4. Vexen takes great pride in being a scientist and thinks highly of himself both when he was a Somebody and a Nobody. Reality is, Vexen was annoying. An annoying nobody–imagine! It should be well noted that his boss fight against Sora is no joke, but what a coward! Despite being one of the originals and the fact that his experiments were the driving forced of much of the events in Chain of Memories and 358/2 Days, he allowed himself to be bullied, intimidated, and belittled by his fellow members. Although Xemnas clearly valued him due to his experience as a scientist, putting his experiments to good use in their overall plan, both the Riku Replica and Xion puppet failed horribly, forcing Xemnas to have to send the remaining members to hunt down Roxas and bring him back. Maybe that is why his throne was the lowest of them all. Considering his own comrades did not care for him, it was hard for us to really care for him either. One can only imagine that Vexen’s lack of success as a Nobody was mirrored by his lack of success as a Somebody, which leaves the question of why bother with this guy. He is a pain to see and hear. Not sure if we will see his Somebody again, however in the Chain of Memories manga, it was revealed that Vexen created replicas of his own self as a Nobody. Maybe Tetsuya will tie that in somehow and we will see Vexen’s Nobody again, or maybe we will just forget all about him. 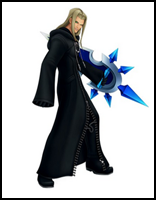 Lexaeus is the 5th member of the Organization, an original apprentice of Ansem the wise, and Zexion’s right hand man. Lexaeus…who? Of all the Organization members, he’s the least memorable of all. 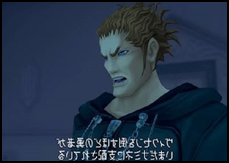 Although both had limited importance, at least Luxord had an interesting battle and Xaldin was the toughest, but Lexaeus was mostly forgettable. That is all we know about the 5th member of the Organization. He is easily forgotten. He was not a difficult fight in Chain of Memories as he is slow, and Riku is extremely fast. He seems to be a waste of space and almost makes many people ask what the point of his character was. He never said much of anything, and for being the largest member of the Organization, you would think he would play a more damaging and stronger role like Xaldin did at least. Although some Organization members may not have great importance to the organization, Lexaeus doesn’t even have great importance to the game at all. Seriously, Xion was more important than him and she was a replica. The Riku Replica played a larger role in Chain of Memories then he did. He was very much game filler. The Original six members should have all had a stronger presence being the reason behind the series, but Lexaeus was very underdeveloped in the series as a whole. It’s unlikely we’ll be seeing him again. Thanks for tuning in for our Organization special and leave your comments below! Part III will be posted on Friday, June 24th. Stay tuned during the next two weeks for even more installments! A normal resident on the KHU forums, Cloudy is a big fan of Final Fantasy 7 and its related games. Incidentally, she and her identical twin sister are both authors of this article and spend quite a bit of time discussing the intricacies of Kingdom Hearts (perhaps being twins help them relate to Roxas and Ventus a little deeper…). With the bubble of ideas Cloudy and her sister has, readers can expect to see more of their work in the future.